Interview • Playing a sailor in peril in "All Is Lost" was hard, but "all in all, it was worth it." It&apos;s not unusual for your average 77-year-old man to lose some hearing in one ear. 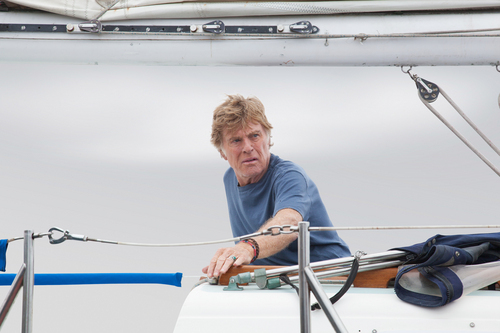 Robert Redford is not your average 77-year-old man. So the story of how he lost partial hearing in his left ear is highly unusual. 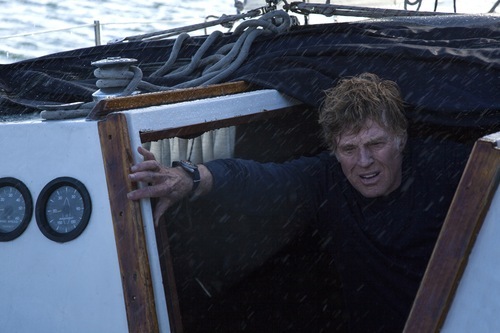 It happened while Redford was working on his latest movie, and what many are calling the best performance of his career, the survival drama "All Is Lost" (which opens in Salt Lake-area theaters on Friday). 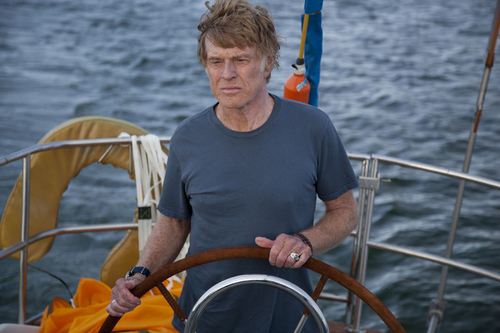 Redford&apos;s unnamed character is on a solo sailing trip across the Indian Ocean when disaster strikes. Alone, he must deal with a sinking boat, harsh weather and being cut off from the rest of the world. In one particular scene, filming in the same tank in Baja California where James Cameron shot "Titanic," Redford acted through an intense man-made storm. "We were at the apex of the storm, the boat was tossing and turning and just about to tip over," Redford said in a recent phone interview from New York. "The wind was coming in, the rain was coming, the waves were getting to be 6 or 7 feet. "I was having to crawl along, to fix something, against tremendous wind. I was being hit with everything." 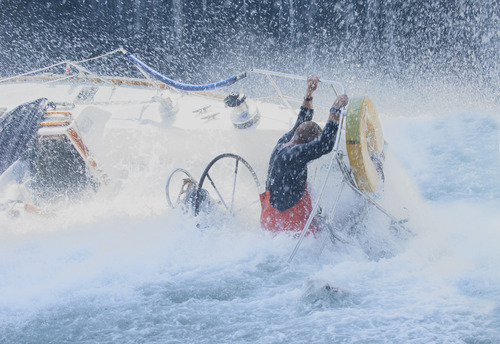 On Redford&apos;s left side was a crew member with a firehose, with a hard stream of water simulating the crashing waves. "We did about four takes," Redford said. "It kept hitting in the same side of my head. I couldn&apos;t see anything. I was just groping my way along. I just remember getting hit on the left side of my head." He developed an ear infection, and when it cleared up, he noticed his hearing was decreased. "I went to a hearing guy in Utah, and he said, &apos;You&apos;ve lost a substantial part of your hearing in that ear.&apos; I asked, &apos;Am I going to get it back?&apos; He said, &apos;No.&apos; "
The partial hearing loss, Redford said, was an acceptable risk, considering the challenge of the role. "All in all, it was worth it," he said. "I&apos;m proud of the work. I felt it was a chance to do something at this point that was different and bold." That chance started when J.C. Chandor, the movie&apos;s writer and director, was part of a small crew on a weeklong sailing trip through the southern Caribbean some years ago. The boat encountered a substantial storm on the last few days, and "I promised never to leave sight of land again," Chandor said in a phone interview last week from San Francisco. Chandor was struck by "a lot of the aural [experience], the claustrophobia that comes with such openness, all kind of stuck with me as a visual, cinematic, interesting thing." He was reminded of that a decade later, while editing his first movie, the financial-disaster drama "Margin Call" (for which he received an Oscar nomination for his screenplay). On the train to Long Island from his family&apos;s home in Providence, R.I., that winter, he saw sailboats dry-docked in Connecticut railyards. Seeing boats that spend most of the year unused, he thought of their owners. So he created a character "who had this unused potential of adventure." On the train, Chandor wrote a letter, written by this character at the end of the drama, that served as an apology to those he left back home. "I didn&apos;t quite know what the story was or how we got there," Chandor said, "but the movie would begin with this death letter." In the next four or five months, Chandor wrote a 31-page screenplay  well short by Hollywood norms, which usually equate one script page to one minute of screen time. The screenplay broke other rules. There were no flashbacks. There was no backstory. There were no other onscreen roles. And there was almost no dialogue, aside from that letter, which is delivered in voice-over at the beginning. "That was the first thing that enticed me," Redford said of the script. "It drew my attention because it was so bold. It was clearly defined, almost like a storyboard. And there was no dialogue. Right away, I was halfway there. … I guess it was what I was looking for at this point in my career, or in my life." Before he would commit, though, Redford had to meet Chandor, whose previous exposure to the actor was when "Margin Call" premiered at the 2011 Sundance Film Festival. "I just needed to know that he wasn&apos;t crazy," Redford said. Meeting Chandor, Redford said he saw that "he was very clear, and he had a vision that was very succinct." "I love Redford&apos;s films," Chandor said. "I love everything that he&apos;s managed to do with his life. He&apos;s created … an industry for independent filmmakers where we could make a living doing what we were doing." That said, Chandor saw in Redford "untapped potential," much like his adventure-seeking character. "There was always this feeling that there was kind of this one performance, to get him to fully expose himself as an artist," Chandor said. "I think there&apos;s a couple of moments in the third act where he does that." Before filming, the plan was that stunt doubles would handle the physical aspects of the role  like climbing the mast or weathering the walls of water. After all, movie producers aren&apos;t eager to risk the safety of the talent, particularly a 77-year-old movie star. Once work started, Redford said, "I guess my ego kicked in." He said he has enjoyed doing his own stunts, so when production started in Mexico, "I said, &apos;Well, why don&apos;t you let me try this.&apos; And when I would do this, [J.C.] would get excited that he could film me completely," Redford said. Redford said he ended up doing almost all of his stunts. "That took its toll, but finally, I think it was worth it," he said. "As an actor, you always commit your whole self to the role. If I could, I would want that to be a complete performance." 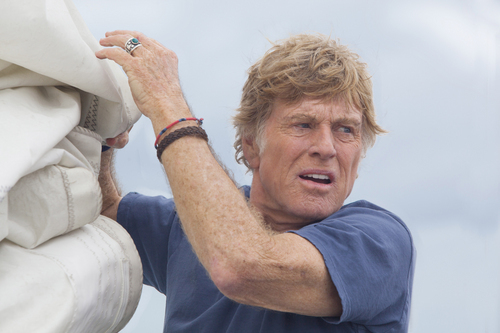 Chandor said watching Redford navigate the stunts was "fascinating." "This is his life, this kind of work. It&apos;s something he&apos;s comfortable with," Chandor said. "He&apos;s grown up, through his whole career, trusting when they build a contraption to go to the top of the mast, that it&apos;s going to hold him. And he just gets in there." 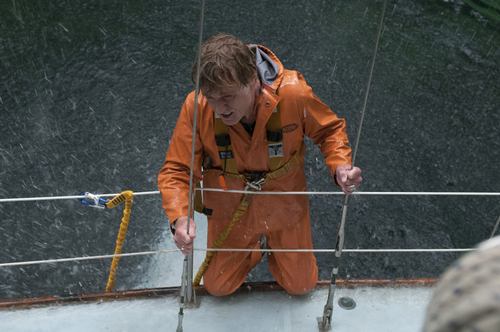 That said, the stunt work in "All Is Lost" is more grounded than the heroics of a blockbuster action movie. "No one of the elements was superhuman, and he could actually chip away at it," Chandor said. "Every event is within grasp. It&apos;s only once they all start piling up on each other that you realize there&apos;s this herculean task about the whole thing." While the role called upon Redford to use his body, it required little of his voice. "It doesn&apos;t bother me," he said of having nearly no lines throughout the film. "I&apos;ve always felt that silence was dramatically as important as noise or talk. … I felt that, between the character and the action, words can be used as a filter to explain things. If you take that away, it&apos;s more pure." Chandor set a few basic ground rules about Redford&apos;s character  that he has someone waiting at home, that he&apos;s an accomplished sailor but that his plight has pushed him beyond his level of expertise  but otherwise the director avoided talking to the actor too much about the character&apos;s backstory. "All I need to do is to fill it in with my behavior," Redford said. Redford said the character  listed in the credits only as "Our Man"  is similar to one of his iconic roles: the isolated mountain man, who was the title character of the 1972 Western "Jeremiah Johnson." "It almost made it existential as a piece of film," he said. "When all odds are against, when all seems to be lost, when there seems to be no hope, no purpose, no chance, most people quit. They give up. And, for whatever reason, others just keep going. There&apos;s no other reason than just that, they just keep going because that&apos;s all there is left to them is just to continue. They just continue, without knowing why or how. Just because."